Lactic Acid Market size was above USD 1.65 billion in 2015 with gains expected at above 12.5%. Polylactic Acid (PLA) Market size was above 500 kilo tons in 2015 and is poised to grow at significant growth rate. Strong inclination towards recyclability, green packaging and should boost PLA market size growth. Growing application from industrial and personal care may promote lactic acid market size. CMI study describes that 97% retail executives were of the opinion that consumers should influence green packaging market demand positively. In 2012, an analysis conducted by DuPont Packaging Magazine exhibited that sustainability issues are trending which may fuel PLA market size. Bioplastics market size should foresee gains at over 20% owing to increasing packaging application scope and environmental awareness should boost polylactic market size. PLA is recyclable, extracted from renewable bases and have enhanced characteristics compared to fossil fuel derived plastics. Bioplastics are majorly biodegradable and made from biomass sources. According, to European Bioplastics chief bioplastics are bio PET, bio PE, biodegradable polyester and PHA. Novomer, BioAmber, DuPont and Genomatica had started developing biobased building blocks which should encourage product innovation along with substitution for synthetic chemicals. Increasing bioplastics applications and favorable norms towards biomass materials would positively influence PLA market size. Plastics are produced with the help of non-renewable natural gas and crude oil resources. Thermoplastic ingredients are applied to packaging owing to features which includes light weight and heat resistant. Crude oil index is volatile, which should promote PLA market growth as preferred ingredient for various packaging and textile applications. PLA can distort and warp at comparatively low temperature. Ingredients usage over a definite humidity threshold might result product damage, causing barrier in packaging applications. NatureWorks conducted an independent study which detailed about polylactic acid uses 65% lower energy when compared to manufacturing conventional plastic and produces 68% GHG emissions with no toxins. This factor would promote PLA market size. Conventional polymers which includes polystyrene and polypropylene costs lower compared to polylactic acid price trends, which can obstruct the industry. Technological development for glucose fermentation have minimized manufacturing cost resulting in lowering lactic acid and PLA market price trend. Polylactic acid market size from textile application should register USD 950 million by 2024. It serves the purpose of textile dyeing used for biodegradable based polymer production and hide deliming in leather processing. Growing Government norms and rising environmental worries may drive PLA market size. PLA market size from packaging application, was over USD 600 million in 2015. The product is used for containers, jars, bottles and food packaging label applications. These bottles are durable, disposable, transparent and glossy in characteristics. It is also easily degradable as compared to fossil fuel derived products and do not emit harmful gases on burning. 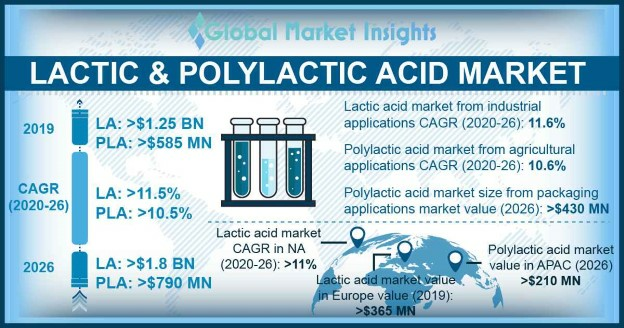 Lactic acid market share in industrial application should witness gain at above 12%. It finds application in biodegradable polymers and lactate solvents production. Lactate ester solvent including butyl lactate and ethyl lactate are biodegradable and non-toxic in nature and provide use in consumer and industrial applications. LA market size from personal care & cosmetic applications might witness above 12.5% gains. AHAs (Alpha hydroxyl acid is used in anti-acne, skin care and anti-ageing products and solutions. It has milder effect compared to glycolic acid which supports exfoliation and hydration process. Lactic acid market share from food & beverage application, was over USD 600 million in 2015. It is used in wide varieties of products including beverages, meat products, salads, ready meals, confectionery, dairy products and bakery products. It is also used for refining microbial quality, pH regulation, flavours, preservatives and acidulants. Food & beverage industry might show important gains in the future which might boost LA market demand. Europe, dominated by, France and Germany PLA market size, was above USD 400 million in 2015. Increasing number of production facilities and with more sustainability focus which should influence positively for regional industry growth. Government norms and market entrance of biobased ingredients in packaging industry should drive PLA market size. Japan lactic acid market size should register gain at over 12.5%. Increasing feedstock abundancy, production capacity and consumer awareness must drive regional industry growth. China PLA market size may foresee gains at above 15% by 2024. Corn starch is upstream raw ingredient used and downstream raw materials include food & beverage, medicine, electronics, chemical engineering and cosmetics industry. Strict regulatory outline regarding use of biobased ingredients and products would increase regional PLA market growth. Global lactic acid market share is concentrated. Some companies operating in PLA market are BASF, Galactic, NatureWorks, Corbion Purac, Pyramid Bioplastics, Danimer Scientific, Dow Chemical, Synbra, Henan Jindan Lactic Acid Technology, Musashino Chemical, Futerro, Teijin and Wei Mon Industry. Maximum companies derive lactic acid by the procedure of fermentation, due to its low cost production and necessity for bio based goods. Lactic acid manufacturers derive raw ingredients for fermentation, which may rightly provide to food & beverage, personal care formulations, industrial and pharmaceutical applications. Polylactic acid is biodegradable, produced from renewable bases and have enhanced properties compared to petroleum based polymers. Increasing product demand owing to inherent characteristics including odour barrier and flavour features. Rising consumer awareness involving recyclability, green packaging and necessity for sustainability should drive global PLA market demand. Bioplastic packaging including loose fill and rigid packaging has gone through significant rules and regulatory support, for the need of minimizing GHG (greenhouse gas) emissions, which boosts the PLA market size growth.